Uganda is a landlocked country in East Africa, famous for hosting the source of the River Nile which can be visited in Jinja. It has a population of 40 million people, 56% of whom are below the age of 18. The country is made up of different kingdoms, and 56 tribes and languages. Uganda gained independence in 1962 and is ruled by a constitution with President Yoweri Museveni. Challenges are faced by people living in both urban and rural Uganda. In the main cities, there are large slum dwellings where people move to the city in hope of a better life but the reality is very different. Rural areas also suffer from weak economies and limited jobs. 66% of the population rely on subsistence farming, that is growing their own daily food, and maybe having enough to sell. International Needs Uganda (INUG) is based in Buikwe District, 75km from the capital Kampala. This is a rural community where many families live in poverty and face numerous challenges. The work in Buikwe began during the HIV/ Aids pandemic in 1994, when International Needs Uganda began a Child Sponsorship programme, providing orphaned children with access to education. INUG now run four schools and provide sponsorship for over 3,000 children. Since 1994, INUG has also ventured into other ways to combat local poverty through various community development projects, including building Makonge Health Centre, running 5-year HIV/Aids prevention programme, Pastor training, a four-year farming project and most recently, a Water and Sanitation Project. International Needs Uganda wants to see real and sustainable change for families in Buikwe and neighbouring districts. Browse below to read about our main current projects running in Uganda, empowering poor and vulnerable families. Could you donate, fundraise or partner with us on these projects? Get in touch with Ali Mbugua, our Programme Manager, to find out more about these projects and how you can help us reach more people with this life-transforming support (alim@ineeds.org.uk, 01883 331332). Main exports are coffee, fish and fish products, tea, tobacco, cotton, corn, beans and sesame. Main religions are Christianity and Islam. The infant mortality rate in Uganda is 38/1000 live births. Mortality rate for children (under 5) is 90/1000. Main causes of child mortality are preventable diseases such as malaria and waterborne diseases. Life expectancy in Uganda is just 59 years. Indirect costs of education still prevent many children from accessing an education. 14% primary school children don’t go to school. 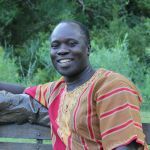 Justus has been the Executive Director of International Needs Uganda for over 10 years, he originally trained as a teacher, and then later studied health administration (Dip) and Business studies, he is also an Anglican minister co-pastoring a church St Johns Kampala. Justus is married to Deborah and they have three children.